Spend your time launching and growing your business, instead of building an accounting department. 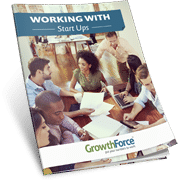 GrowthForce works with funded start ups to develop a scalable accounting solution for pre-revenue emerging growth businesses. We deploy a QuickBooks®-centric financial system that integrates the entire front and back office systems, including billing, banking, payroll job costing, credit cards, expense management, and more. You'll have peace of mind knowing your financial operations are under control and you can still put your fingers on your numbers whenever you need them. We'll also keep your investors happy by delivering the financial reports they require on a monthly basis. GrowthForce helps technology start up establish a scalable accounting solution as it prepares for rapid growth.